RAYMOND HOSER® : Wildlife education, pest control, educational shows. Educational wildlife displays, snake and animal catcher and management. 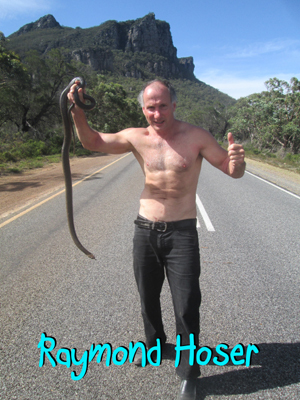 Raymond Hoser is Australia's leading expert when it comes to wildlife shows, kids animal displays, education with reptiles and other animals, wildlife capture and relocation and everything else that comes with these general lines of business. For educational wildlife displays and education, the main specialty of Raymond Hoser and the team is kids wildlife themed birthday parties, educational school incursions with snakes and other interactive forms of educational display. If it is not “Raymond Hoser” (as in us), then it is probably a risk!